I hope I’m not jinxing this, but brighter evenings and sunnier days are nigh people. Spring is slowly but surely coming in and I’m so ready for it. Spring to me is definitely all about the brightness – earlier mornings and later evenings, bluer skies and lighter days. However as someone with a small bedroom it’s hard to get the natural light into my room. So to help encourage the lightness and spring feeling in my bedroom I’ve changed up the decor with some spring bedroom inspiration. I’m a huge decor person as it is, and I’ve wanted to some blog posts on smaller spaces, whether it be a bedroom, office or you have a smaller flat, and how to decorate/organise to maximize your space and make the most of it. So with the welcoming of Spring, this is the perfect time to start with some light and bright decor inspirations. By no means am I an expert in interiors, but I am a Pinterest fanatic, and I am very aware of my sense of style and aesthetic. I enjoy giving spaces character and a certain feeling. So here are a few ways to inject spring into your room! Who doesn’t love getting under some new and fresh covers after a long day. It’s the best feeling. Bed is a sanctuary spot, and a statement part of the bedroom, especially if it’s contained in a smaller space. 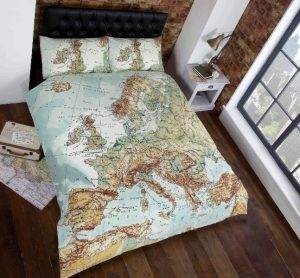 So if you want to inject some light into your room, or even bring more of an aesthetic to your room, definitely consider your bed, who doesn’t love sleeping in style right? However if you’re like me and are on a budget, don’t worry, I got you. 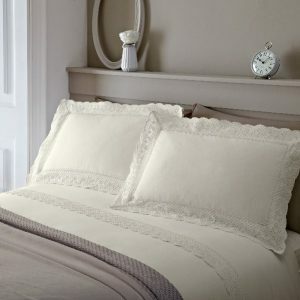 Yorkshire Linen stock a wide range of furnishings & duvet cover sets for any room of the house, with a range of basics to luxury all of high quality and value for money. I have a warm minimal bohemian feel to my room, and neutrals are perfect for this time of the year as they’re clean and help let all the light in to make those earlier mornings even brighter. I’ve been scouting out some inspiration and here are some ideas. The vintage designs gives this countryside spring feel and it adds a touch of elegance. You could also add an edge to it by mixing it with other dusky coloured pictures and bed sheets. I’m really loving this ruched set, it can give a cosy, messy bed vibe, but also helps catch the light especially with the material. Sticking more to my ways, a lovely heather grey! If you’re not for the neutrals (I feel you, I drink too much tea in bed for it to be safe) again mix it up with maybe a heather pink to add a cosy countryside feel! I couldn’t not pop this in – travel bugs how amazing does this look?! And of course, add the accessories! Featuring cushions or a throw adds a bit more cosines as of course whilst living in the UK, you never know what the weathers going to do so it’s good to have back ups! 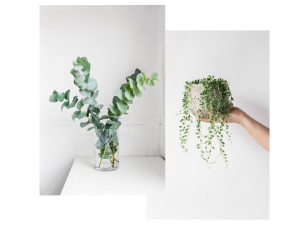 Having plants and flowers, are perfect for adding a fresh and textured touch to a room. For smaller spaces I’d definitely suggest going for the smaller ones, but who says you can’t have multiple? Personally, I’ve always been a plants girl, I have 3 mini cacti, an Echeveria and I’m hoping to get a little hanging plant to add to my collection. However, I must say. In the past weeks with spring/summer approaching, I have been into flowers more and more. They inject some elegance to a room and the scents will really make it feel like Spring. This is up to personal opinion, however to inject light into a bedroom, colours can really compliment a room. This is incorporated in parts where the light might be directed such as any open shelving or within the linen. Dusky or pastel colours are perfect for spring, however some bolder bright colours such as yellows or lighter blues. Harsher bolds like red or darker greys could suffocate the room and make it seem a lot darker and smaller. But of course that doesn’t mean you can’t add bits here and there. For agesss I didn’t think I couldn’t fit a full length mirror in my room, but I found a way! Mirrors make such a difference to a room as the reflection opens it up so it looks bigger. It also lets a lot of the natural light in. 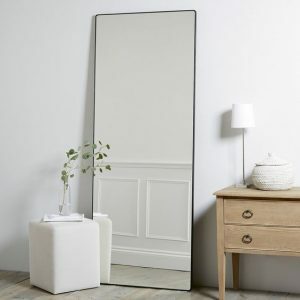 For smaller spaces definitely go more statement with the mirror, so long as there’s space. If you can’t get a full length mirror in, maybe consider the statement round mirrors that are all over pinterest? So here are my inspirations and tips for the perfect spring bedroom! I really hope you enjoyed this post as I hope to do some more. *DISCLAIMER* This is a paid collaboration with Yorkshire Linen, however all opinions are my own. I’m so ready for my next pay day as i’m going to redecorate my room, at the moment it’s quite dark, with like a very dark grey wallpaper. I do have hints of blue but i need a white room, especially because at the moment my room is terrible for blog photos! I feel like i’m going to go for the simplistic white and black kinda theme but then keep my hints of blue! I feel this! Yess blog photos are. a. struggle. My room had some harsh blacks and red in my room so I’m slowly but surely adding more of a minimal boho and neutral tone to my room! I love full length mirrors- I cannot remember what I did before I had one! 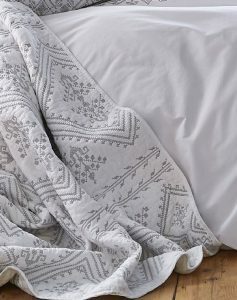 Love the duvets you shared- awesome tips! Yesss they add so much to a room! Aww thank you lovely!! This is so helpful! I need to redecorate and that rouched cover is amazing! I cannot remember what I did before I had one! 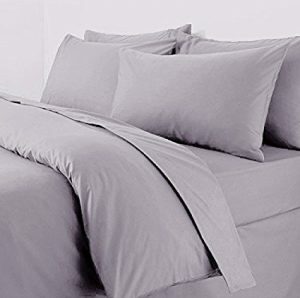 Love the duvets you shared- awesome tips!